This weekend, Robert (boyfriend/official taste-tester/grill-master) took me to my very first University of Michigan football game. We had a great time, the team won, and he showed me around the beautiful campus and darling town of Ann Arbor. Sunday afternoon on our chilly, drizzly drive back to Chicago, we’re mid conversation when he suddenly veers off the highway. There’s no rest stop or gas station around. “Where are we going?” I ask. He points to a small building with piles of pumpkins and produce outside. A farmers market. Does he know the way to my heart or what? After a quick lap around, we each grab a basket and begin loading them up. Spaghetti squash. Beets. Corn. Raspberries. Macintonsh and Honeycrisp apples. Butternut squash. Peaches. Potatoes. Onions. Zucchini. I fill mine until the metal handles make an indentation in my forearm and I question how much longer they’ll stay attached to the basket. That should do it. We purchase our produce (a combined total of less than $20) and head back to the car. The moment we hit the road again and the cold rain splashes against the windshield, I already know what the future holds for most of my fresh finds: Minestrone soup. It’s one of those soups that require no recipe and changes every time I make it depending on what I have. But it’s always delicious. Before arriving home, I stopped by Whole Foods to fill in a few holes for the meal (and for the rest of the week). Shortly after opening the door to my apartment, before I even thought about unpacking, I got to work slicing and dicing. In less than an hour dinner and an episode of Mad Men were served. It was the perfect homecoming after a wonderful Fall weekend away. Heat the oil in a large pot on medium-high heat. Add the onion and garlic. Sauté for 5 minutes. Add the carrots. Sauté for 5 more minutes. Add the broth and tomatoes with their juices. Cover and bring to a boil. Add the beans and potato. Simmer until potato is fork-tender, 15 to 20 minutes. In a separate pot of boiling water, cook the pasta. Once al dente, about 10 minutes, drain. Once the potato is fork-tender, add the zucchini, squash, and Swiss chard to the soup. Season to taste with salt and pepper. Cook a few more minutes until chard is wilted. At the farmers market, Robert grabbed a few ears of corn. “Can you make some corn tonight, too, please?” he asks. While my mind has moved on from sweet summery corn, I told him I could easily boil a few ears—no problem. However, once I started making the soup it dawned on me that I was using the big pot that I’d normally use for corn. Shucks! (Ha.) What other options did I have? The grills at my building are closed up for the season. I could cut the ears in half and use a smaller pot….like the one being used to cook the pasta. That wouldn’t work. Could I roast it? I’ve roasted just about every other kind of veggie. I jump online (on my iPhone….I’m starting to see the benefits of having an iPad in the kitchen) and a quick Google search takes me here. I discover that roasting may just be the easiest way to cook corn. Ever. The recipe is for a corn salad, but it starts with roasting the corn. I figured that’s where I’d end. If you pick up a couple of ears of corn in the next few weeks, I highly recommend giving this method a try. You literally stick the corn—husk and all—in the oven and leave it. Apparently, the husk traps the steam in, which helps cook the kernels. It came out sweet and crunchy—just the way it’s supposed to be. Preheat oven to 400. 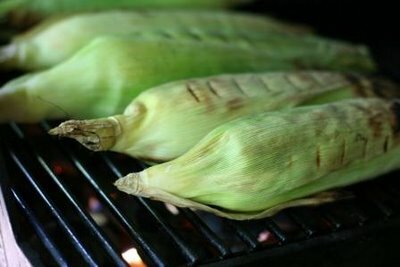 Place the corn (in the husk) directly on the center rack and roast 35-40 minutes. Remove from the oven and allow it to cool for about 5 minutes before removing the husks. 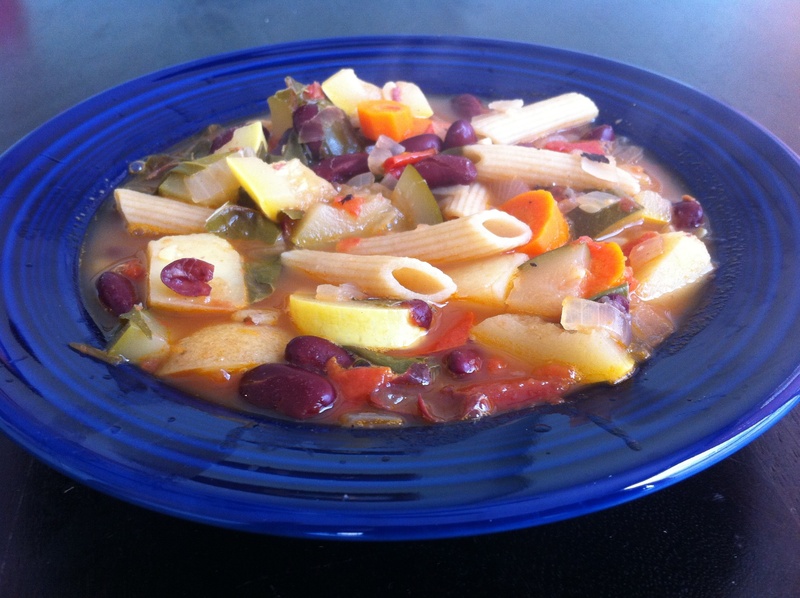 This entry was posted in Soup, Vegetables on September 26, 2011 by Paige Greenfield.